Qualtrics surveys can be used for event registrations, satisfaction surveys, online forms, academic research, training, and more. Join us for an Introduction to Qualtrics training session from 3-5 p.m. Wednesday, April 24, in 306 Calvin Hall. All students, faculty, and staff who use this research suite are welcome to attend. Graduate and undergraduate students must work with an advisor/supervisor for access to Qualtrics using this request form. Registration through HRIS is required. See Using HRIS to register for classes. 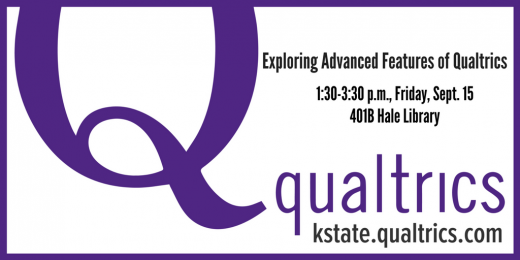 “Exploring Advanced Features of Qualtrics” is scheduled 1:30–3:30 p.m. Fri., April 5, 2019, in 306 Calvin Hall (a computer lab). All students, faculty, and staff who use this research suite are welcome to attend. Qualtrics surveys can be used for event registrations, satisfaction surveys, online forms, academic research, training, and more. Join us for an Introduction to Qualtrics training session from 1:30-3:30 p.m., Wed., Nov. 28, in 306 Calvin Hall. All students, faculty, and staff who use this research suite are welcome to attend. No registration required. “Exploring Advanced Features of Qualtrics” is scheduled 1:30–3:30 p.m. Friday, Feb. 16, 2018, in 401B Hale Library. All students, faculty, and staff who use this research suite are welcome to attend. “Exploring Advanced Features of Qualtrics” is scheduled 1:30–3:30 p.m. Friday, Sept. 15, in 401B Hale Library. All students, faculty, and staff who use this research suite are welcome to attend. 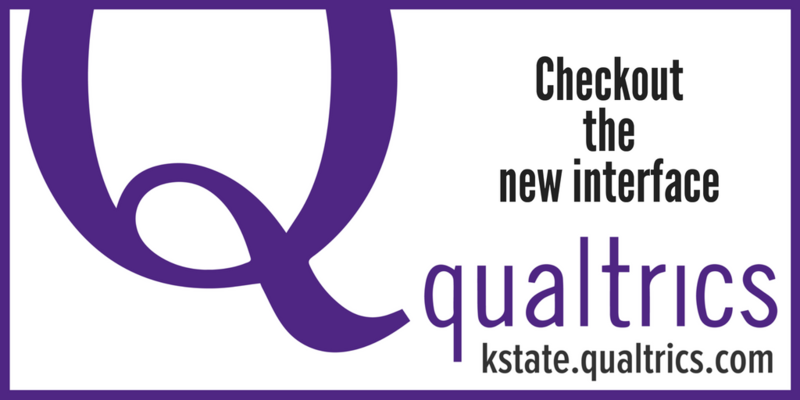 The Qualtrics tool that powers K-State Survey is one of the most sophisticated online survey and research tools on the market. At K-State, it is used for research, teaching assessment, event registration, large-scale policy compliance trainings, late TEVAL evaluations, and more. There is also a new integration from Qualtrics to NVivo 11 Plus for direct access to online survey data for qualitative and mixed methods analysis. 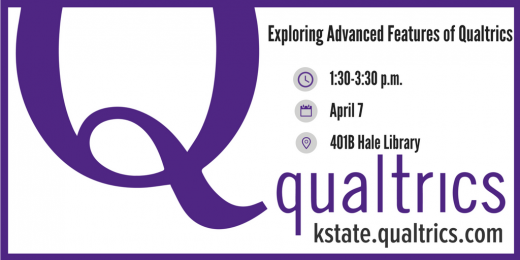 “Exploring Advanced Features of Qualtrics” is scheduled 1:30–3:30 p.m. Friday, April 7, in 401B Hale Library. All students, faculty, and staff who use this research suite are welcome to attend. Ready to start learning how to use the tool? An Introduction to Qualtrics training is 2:00-3:00 p.m., Thursday, March 30 in 318 Calvin Hall. All faculty, staff, and grad students are welcome to attend. No registration is required. If you have any questions, contact Rebecca Gould (ragou@ksu.edu) or Cathy Rodriguez (cathyr@ksu.edu). “Exploring Advanced Features of Qualtrics” training is 1:30–3:30 p.m. Friday, Nov. 11, in 401B Hale Library. All faculty, staff, and students who use this research suite are welcome to attend. On Tuesday, Aug. 17, K-State transitioned to the new Qualtrics interface which is called the Qualtrics Insight Platform. As part of this update, Qualtrics introduced new features, including a new projects framework, more options for distributing surveys, and an improved way to view responses and results. Need help getting started with Qualtrics? Rebecca Gould and Cathy Rodriguez will offer an Introduction to Qualtrics training session, 3:30-4:30 p.m., Tuesday, May 3, in 407 Hale Library. 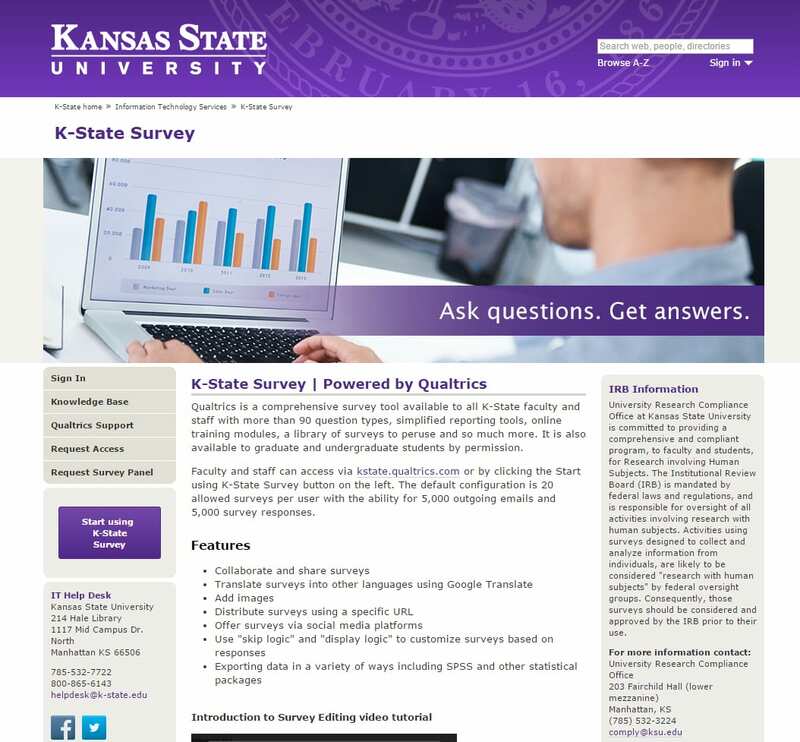 Qualtrics, one of the many tools and services available at K-State, used by K-Staters to create surveys. But did you know that you can use Qualtrics for other things, such as creating polls and managing event registration?